This video lesson will focus on systems that are said to be in equilibrium – that is, systems that are not allowed to move away from their original places or rotate about their axis. Students will learn about static equilibrium by exploring themselves what is meant by translational equilibrium and rotational equilibrium and whether an equilibrium is Stable, Unstable, or Neutral. Applications of this phenomenon to real life will also be made, emphasizing how important balance and stability are in many realms, including engineering, construction, manufacturing and for all living creatures. A classroom teacher has the option of completing this lesson in one class period, or dividing it into two. Students should have some understanding of the following concepts: Newton’s laws of motion; Center of mass (gravity); Translational Equilibrium; and Rotational Equilibrium. Materials needed for conducting the experiments during the video breaks include: uniform rod; non-uniform rods such as trunks or pieces of woods; different weights; strings; ruler; irregular objects; glass cup of water; match; spoon; fork; and scissors. In-class activities during the video breaks include small group experiments, problem-solving and discussions. 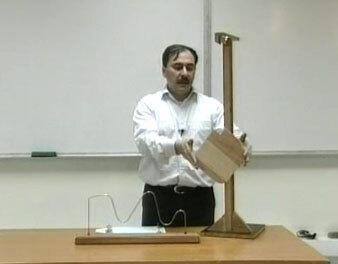 Hassan K. Al-Juwhari, Ph.D. is an Assistant Professor of Physics at the University of Jordan in Amman, Jordan. This site, created by the University of Sydney Physics Education Research group (SUPER), provides a set of activity-based physics tutorials and worksheets developed for introductory classes made up of students with little background in physics. Each worksheet is supplemented with a complete solution and full description of all suggested activities. This site, sponsored by ComPADRE, presents an interactive student guide to an introductory course in Statics. Each section contains an interactive case study that presents users with a real-life problem to solve. Video clips and interactive simulations accompany each problem, as well as background information and related theory. This is the Open CourseWare site for MIT Professor Walter Lewin’s videotaped lecture on Static Equilibrium.